Another way of saying "share the goods, comrade" is all they're capable of coming up with. The fear of vague ecological something-or-other is in the view of the great European minds, just another necessary wedge issue/crobar to carve away at democracy by banal rulemaking and use dirigism and subsidies to place the role of work and industry under state control. The seeming smallness of their motives is as stunningly ignorant as the unthinking ease with which they will concider such a huge and sweeping disposal of the idea that overbearing and invasive state regulation of society is somehow harmless and inherently good. There is a certain animal walking the streets of Chelsea, Manhattan, and of course the beautiful narroways of Saint-Germain who truly believe that all it takes is sitting down with a fellow of good cheer in the hopes of reaching la prétention de latte. A misguided belief that all peoples hold all truths to be self-evident. As our brothers and sisters in Mumbai will attest, first-hand, some people want to kill you because you are you. Of course, you may think that you being you is wonderful under the reassuring and undulating strobes of the discothèque du jour chasing tablets of ecstasy with the ubiquitous kir royale. A wonderful life if you can get it. There is both growing public reluctance to make personal sacrifices and a distinct lack of enthusiasm for the major international efforts now underway to battle climate change, according to findings of a poll of 12,000 citizens in 11 countries, including Canada. No doubt as well that this ends the year on a sour note for all involved (the poll is listed as commissioned by the Earthwatch Institute). Six to eight months ago there was undoubtedly great hope. Ideas were pitched, proposals were written, funding obtained, meetings held, powerpoints prepared, urgent emails exchanged, questions worked, polling firms contacted, contracts signed, PR strategy created, and joy all around. Then those bloody proles got involved and ruined everything with their so-called "answers". No screaming headlines in the Guardian, no prominent mention in a Monbiot piece, no banner headlines, no doom and even less gloom. 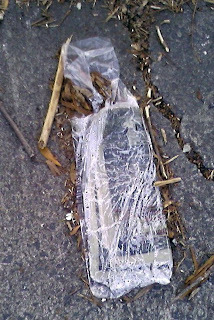 Just a tattered unread press release left on the sidewalk. …increasingly to meet a young American male about 25 is to hear a particular nasal stress, a much higher tone than one heard 40 years ago, and, to be frank, to listen to a precious voice often nearly indistinguishable from the female. German Chancellor Angela Merkel faced calls from fellow conservatives Sunday to fight to water down a European Union climate pact until the recession-wracked economy is moving again. Bavarian premier Horst Seehofer said in an interview with the Bild am Sonntag newspaper that he had written to Merkel calling on her to back away from EU climate protection goals to be approved next month for a time. German Economy Minister Michael Glos, also of the Christian Social Union, the Bavarian sister party of Merkel's Christian Democratic Union, agreed that Germany could ill-afford to make a priority of climate protection with the economy hobbled by the global financial crisis. "It is not the time to burden the economy with excessive environmental targets," he said. Canada's two largest airlines must give disabled and morbidly obese passengers an extra free seat on domestic flights, beginning in January, after the Supreme Court refused yesterday to consider the carriers' appeal of a federal order. The ruling is expected to benefit would-be travellers like Linda McKay-Panos, a Calgarian who has secured a declaration from the Federal Court of Appeal that she is obese enough to be considered disabled. Ms. McKay-Panos, executive director of the Alberta Civil Liberties Research Centre, said yesterday that she has not travelled on Air Canada since 1997, when she endured a "humiliating" flight in which the airline refused her an extra seat even though "my hips were flowing over the arm rest, my hips were basically on the lap of the person who sat beside me." How do you think the person sitting next to you felt? If anything it is they who should be protected from flabby fliers oozing over and under the demarcation line known as the arm-rest. Banks are anathema to stock-market investors now, but Peter Sorrentino of Huntington Asset Advisors sees that changing, probably around the middle of next year. So who does Sorrentino like while they're still cheap? "I don't know what you're buying with Citi," he said. "I'd rather go with somebody where there's less uncertainty. I like Wells Fargo, I like US Bancorp, I think those are much stronger balance sheets." He's bullish on JPMorgan Chase "That's almost becoming an asset play in and of itself," he noted. Sorrentino owns shares of Wells Fargo and JPMorgan Chase. You don't say.... I am guessing US Bancorp is the spread in this baloney sandwich. Wouldn't "perpetually" be a more à propos description?